Kodi is an open source media player software specially designed for televisions and remote controls. It is cross platform and allows users to play and view the most popular audio and video formats converting the machine where it is running in a Home Theater PC (HTPC). In this post the most important steps to install Kodi in Raspberry Pi from scratch will be summarized. If you only want to install Kodi and prefer not to mess up with linux, you should download directly Kodi centered distributions such as LibreELEC or OpenELEC and not follow this guide. These distributions come with a running Kodi version and will require very little configuration from you. The starting point of this tutorial is a Raspberry Pi 3 model B with Raspbian lite version installed and running. You can check these posts to install and configure your system. Before starting the installation, you should notice that running Kodi on Raspbian needs a minimum of 160 MB of RAM dedicated to the GPU. The default assignation is 64 MB, while the most common Raspberry models have 1 GB RAM (Raspberry 2/3 Model B). For the majority of users it is enough to increase this value to 256. On the other hand, you can also change the memory split by editing the file /boot/config.txt. This file contains the system configuration parameters which are traditionally edited and stored using a BIOS. To update the RAM assigned to the GPU, just update the value of the property gpu_mem and reboot the system. Note that the user that launches Kodi should be a member of several groups to ensure that everything works fine. 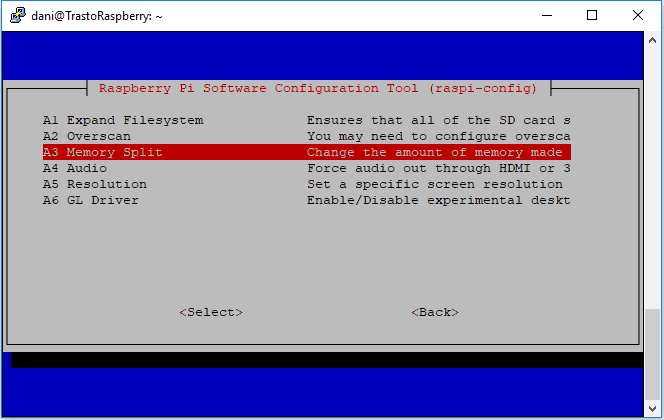 In this post I explained how to copy the default pi user groups to a new user. Anyway, if you experience permissions problems run the following code, replacing dummyUser for the desired user name. As you can find in a quick search in Google, there are a lot of ways of making Kodi to autostart at boot. Once the service is placed, run systemctl enable to configure the service according to the parameters contained in the unit file. The you should be able to start/stop the service as any other linux service.